ATK, an aerospace, defense, and commercial products company, was proud to mark the recent 10 year anniversary of NASAs Earth Observing-1 (EO-1) satellite. The spacecraft, built by ATK for the Goddard Space Flight Center in Greenbelt, Maryland, reached its tenth anniversary in orbit on November 21, 2010. The EO-1 satellite, launched on November 21, 2000, had an initial design and mission life of one year, but has continued successful operations for more than nine years past the initial mission. ATK served as the Prime Contractor, Satellite Mission Integrator and Bus Developer for the EO-1 mission. The Earth Observing One (EO-1) mission developed and validated a number of instrument and spacecraft bus breakthrough technologies designed to enable the development of future Earth imaging observatories. Steep cliffs surround the hot, brown valley that holds Khirbat en-Nahas, one of the largest copper mining and smelting sites of the ancient world. The desolate valley in Jordan is not the cradle you would expect to nurture a civilization, but archeologists Stephen Savage and Tom Levy think it may be the site of an early organized state. Unique among satellite capacity markets, North America boasts especially mature video and networking segments, as well as very broad scale and transparent global purchases by the U.S. military. 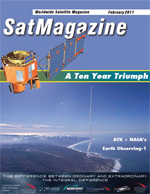 The U.S. and Canada are also satellite innovators, leading the way into new satellite applications best illustrated by the early adoption of direct-to-home (DTH) video business models, and more recently, the successful introduction of satellite radio through Sirius/XM, and direct Internet access (DIA) services such as the WildBlue/ViaSat and Hughes two-way consumer broadband services. Each of these market segments  and others assessed in Futrons 2010 Forecast of Global Satellite Services Demand  have distinctive characteristics, drivers, challenges, and of course, opportunities. Yet with overall annual growth above 3 percent through 2014, and around 2 percent through 2019, North America is likely to remain the worlds largest market for satellite services with forecast demand by 2019 for over 2,150 36 MHz transponder equivalent (TPEs), or 120,000 Mbps of satellite capacity. The Coming Battle For... The Maritime Market, author: Alan Gottlieb, Managing Director, Gottlieb International Group Inc. Wielding fixed priced Ku VSAT services, an army of new vendors has been successfully challenging Inmarsats dominance in the maritime market. Almost overnight, Fleet Broadbands per/byte volume pricing has become less and less attractive as demand for data transmission has soared. Initially, the new fixed priced Ku players were a minor irritation to the communications giant, but now have become a very real threat. In August, Inmarsat finally acknowledged the need for a competitive offering and joined the rush to VSAT with their very own Ka-band VSAT service, Global Xpress. UK-based satellite services specialist Arqiva is going through some internal changes, with existing CEO Tom Bennie stepping down once a new CEO has been appointed, and a restructuring of the organisation into three divisions with Nick Thompson looking after Arqivas broadcast & media division. Thompson is supervising a business thats in robust good shape, helped by its wide portfolio of revenues and pushed along by the UKs aggressive analogue switch-off of its terrestrial TV system and conversion to digital. Having discussed Carrier ID, the way forward and the future thinking on interference, in the last of this series of articles, Martin Coleman presents the industry with a challenge! With the 2012 Olympics drawing closer, which is an enormous undertaking in our world of broadcast, surely that should be our target for the roll-out of Video Carrier ID and other global initiatives? How do we make that happen? One of the most venerated organizations that supports our various industries and market segments is the Space Foundation, an international, nonprofit organization and the foremost advocate for all sectors of the space industry, from civil and commercial to national security. Founded in 1983 and based in Colorado Springs, Colorado, the Space Foundation is a leader in space awareness activities, major industry events, including the National Space Symposium, space-related educational enterprises, and space-related research. The Space Foundation has an office in Washington, D.C., and field representatives in Cape Canaveral, Florida, as well as and Houston, Texas. Mr. Bruun joined KVH in 2008 as the Vice President for Sales and Business Development. His focus was on the planned global expansion of KVHs mini-VSAT Broadband satellite communications service. Prior to joining KVH, Mr. Bruun served as Senior Vice President of Strategic Initiatives for SES AMERICOM, where he concentrated on global mobile broadband opportunities with particular emphasis on the maritime and aeronautical markets. He holds a bachelors degree in accounting from Alfred University and is a Certified Public Accountant (CPA). His considerable experience in the maritime satellite communications industry also qualifies him as an expert on the evolution, importance, and current condition of the industry as a whole. James B. Kramer joined Integral Systems in1999. He is the Senior Vice President and General Manager of the Civil & Commercial Group at Integral Systems. In this role, he is responsible for the Civil Programs Division, the Commercial Programs Division, and two wholly owned subsidiaries located in Toulouse, France and Newcastle Upon Tyne, United Kingdom. Before assuming his current role, Mr. Kramer served in a variety of positions for the company including: Senior Vice President and General Manager of the Commercial Group, Vice President of the Commercial Programs Division, Director of Commercial Command and Control Systems, and Program Manager for the companys efforts on the Intelsat and New Skies satellite programs. Prior to joining ISI, he worked for Orbital Sciences Corporation as a Mission Operations Lead, and for Orion Satellite Corporation (later part of Loral Space & Communications), where he held various positions in the satellite engineering and operations department. Mr. Kramer is a member of American Institute of Aeronautics and Astronautics and active in the Satellite Industry Association and the Aerospace Industries Association. He holds a Bachelor of Science degree in Aerospace Engineering from the University of Virginia. It takes a strong message, one that resonates deeply and broadly with the electorate, to motivate the masses to vote a candidate into office. While politicians and their advisors were fine tuning their messages in the months and weeks leading up to the historic Brazilian presidential elections of 2010, an equally dedicated and talented team of telecommunications experts and technicians from todays leading satellite communications companies were fine tuning and testing the reliability and strength of the nationwide network that would support the surge of citizens casting their vote for the first woman president. Located in an unassuming office park in Boulder, Colorado, UNAVCO is a non-profit, membership-governed consortium sponsored by the National Science Foundation (NSF) and National Aeronautics and Space Administration (NASA), and supports a myriad of science communities  including those who focus on the deformation of ice, imaging the structure of the atmosphere, and the Earths response to ground water, sea level, and other aspects of the hydrosphere. UNAVCO also provides science support through a combination of community coordination, field engineering, technology innovation, and instrument testing.